The moment was incredible on its own; that the CBS announcers saw fit to stay silent for two minutes and forty seconds and let the pictures and sounds from Augusta National’s 18th green tell the story spoke not only to their judgment but also to the unmatched drama that makes television the most valuable medium there is. A few hours later the season premiere of the final season of Game of Thrones brought drama of a different type: scripted, and expensive. The episode is expected to draw around 14 million viewers (and many millions more in pirated streams), and is already a cultural phenomenon. The greatest drama of all in the television world, though, was on the surface far more banal: on Thursday Disney webcast its Investors Day 2019, where it not only gave details on its upcoming Disney+ streaming service specifically, but also clarified the future of TV generally. And, like any great drama, what is happening it not only a compelling story in its own right, but a lens with which to understand far more than the subject matter at hand. In 2013, I posited that TV did multiple jobs for people: it informed, it educated, it provided a live view on sports and other breaking events, it told stories, and it offered an escape, from boredom if nothing else. All of these jobs had the same business model: advertising. Consumers tuned in to watch programming, and native ads — that is, ads in the same format as the content they accompanied — were interspersed. Everything was aligned: consumers liked TV, they got it for free over the air, and advertisers wanted to reach as many people as possible with the most persuasive of mediums. The picture began to change in the 1970s: communities across the country, particularly those whose remoteness or geography made it difficult for households to get a reliable broadcast signal, had for a couple of decades banded together to build a single large antenna to capture broadcast signals and then ran cable from that antenna to homes. It turned out, though, that those cables had both extra bandwidth and, even more importantly, no requirement for spectrum licenses, and first community access TV (i.e. TV that could only be accessed by the community attached to the community antenna network) and later, cable-only channels that leveraged satellite transmission to reach those community cable networks began to proliferate. Over the ensuing years content companies realized that the reason consumers paid cable companies was because they wanted access to the creator’s content (like the aforementioned NFL deal); that meant content companies could make the cable companies pay them ever increasing affiliate fees for that content. Even better, if multiple channels banded together, the resultant conglomerates — Viacom, NBCUniversal, Disney, etc. — could compel the cable companies to pay affiliate fees for all their channels, popular or not. And best of all, it was the cable companies who had to deal with consumers angry that their (TV-only) cable bills were rising from around $22 in 1995 to $54 in 2010. It’s difficult to overstate how lucrative this model was for everyone involved: content companies had guaranteed revenue and a dial to increase profits that seemed as if it could be turned endlessly; cable companies had natural monopolies that they soon augmented with broadband Internet service; and while consumers griped about their cable bill the truth is that bundles are a great deal. I just mentioned, though, the elephant in the room: broadband Internet service. It didn’t take long for the Internet and its marginal distribution cost of zero to quickly take over some of TV’s jobs: information and educational content, for example, were a natural fit for a medium unconstrained by linear time and a finite number of channels. Now you could look up information about anything you wanted to, and the rise of YouTube made that information available in video form. Then, over the last decade, Netflix in particular has aggressively pursued the story telling and boredom-filling jobs that TV does: for a low-relative-to-cable monthly fee Netflix offers as much content as it could get its hands on, both licensed from traditional TV networks and increasingly Netflix-exclusive content from creators directly. Note that in both cases — YouTube and Netflix — the experience and business model are superior to traditional television. YouTube is ad-based, which on the surface seems similar to broadcast TV, but they are ads that can be applied to any and all content algorithmically; this aligns with a service that accepts all types of content, both broadly popular and incredibly niche, and which starts with search, not a channel guide. Netflix, on the other hand, is subscription-based, which is broadly similar to cable TV, but without the intermediaries and advertising. That results in a far better experience for consumers, who can watch what they want when they want it without any annoyances. This alignment is critical. 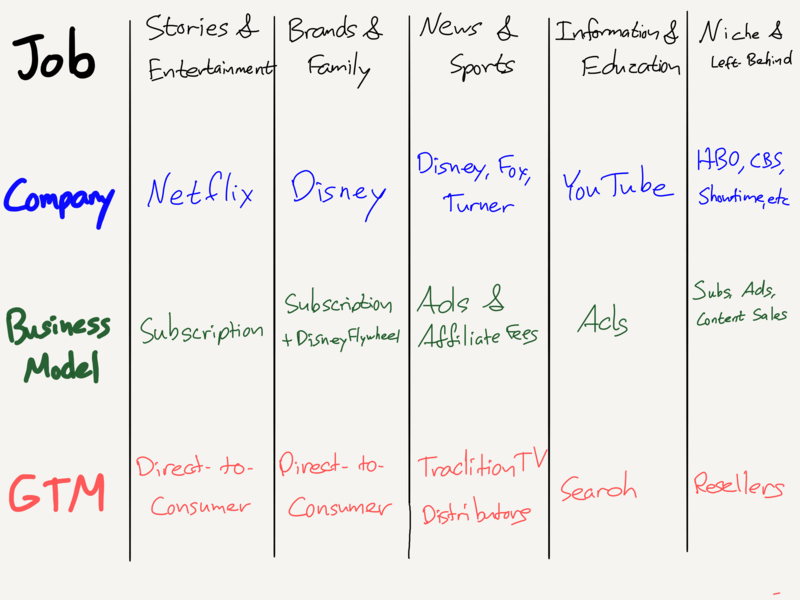 Perhaps the single most defining feature of the Internet from a business perspective is the removal of the means of distribution as the primary point of differentiation in a value chain, and TV is a perfect example. What used to matter was first broadcast licenses and then cable, and everything else about the business flowed from there — that is why all of TV’s “jobs” had the exact same business model. On the Internet, though, anyone can reach everyone with anything. That dramatically increases competition for consumer attention, and to win that competition means developing a business model that is aligned with the job to be done. And, because there are many jobs, there will be many business models. Look no further than that Disney investor event: while most of the time and subsequent attention was given to the new Disney+ offering, the company also spent time talking about ESPN+ and Hulu. At first glance, it might seem odd that the company has three distinct streaming services; why not put all of the company’s efforts behind a single offering? In fact, I just explained why: in a world where distribution mattered more than anything else it made sense for Disney to put all of its television properties together; that offered maximum leverage with the cable companies. On the Internet, though, it is best to start with jobs. Sports are highly differentiated, which mean that people will pay more to get access; this is why ESPN was able to create the affiliate fee business model in the first place, and can continue to drive the highest fees in the industry — by far. Sports are best consumed live, which means that traditional TV distribution like cable or satellite is in fact preferable to streaming. This is in part an issue of reliability but also the result of services like Twitter; speaking as someone who by virtue of my location consumes most sports via streaming, finding out about the big shot on your phone before you see it on your screen is incredibly frustrating. Sports have natural breaks in the action which are perfect for advertising — and thanks to the previous point, there is no option to simply skip the commercials. This is why I have argued that the traditional cable bundle will slowly become the de facto sports bundle; I would add news as well. This is the exact bet that Rupert Murdoch made with Fox; remember that Disney didn’t buy the entire company: Murdoch kept the Fox Broadcasting Company, Fox Television Stations, Fox News Group, and the Fox Sports Media Group. What these assets have in common is that they are perfectly aligned with the traditional TV model: news and sports are best live and drive both advertising and affiliate fees. To that end — and this is where ESPN+ comes in — one of the smartest moves Disney made in the last decade was going on a huge sports rights buying binge. Rights are the most valuable commodity for this business model, and ESPN tried to buy all of them (in part to prevent Fox in particular from encroaching on their dominance). At the same time, for all of the benefits of the traditional TV model, there is still the fundamental constraint of time: ESPN only has so many channels and so many slots to show games, which means it has the rights to many more games than it can ever show on its traditional networks. Enter ESPN+: this service is not a new business model; it is simply an opportunity to earn incremental revenue on the assets (sports rights) that ESPN has already invested in. Sure, ESPN has and will acquire more rights for the service, and make some original programming, but make no mistake: traditional TV is and will remain the core business model for a very long time to come. At the center, of course, are the Disney Studios, and rightly so. Not only does differentiated content drive movie theater revenue, it creates the universes and characters that earn TV licensing revenue, music recording revenue, and merchandise sales. What has always made Disney unique, though, is Disneyland: there the differentiated content comes to life, and, given the lack of an arrow, I suspect not even Walt Disney himself appreciated the extent to which theme parks and the connection with the customer they engendered drive the rest of the business. “Disney” is just as much of a brand as it Mickey Mouse or Buzz Lightyear, with stores, a cable channel, and a reason to watch a movie even if you know nothing about it. This is the only appropriate context in which to think about Disney+. While obviously Disney+ will compete with Netflix for consumer attention, the goals of the two services are very different: for Netflix, streaming is its entire business, the sole driver of revenue and profit. Disney, meanwhile, obviously plans for Disney+ to be profitable — the company projects that the service will achieve profitability in 2024, and that includes transfer payments to Disney’s studios — but the larger project is Disney itself. By controlling distribution of its content and going direct-to-consumer, Disney can deepen its already strong connections with customers in a way that benefits all parts of the business: movies can beget original content on Disney+ which begets new attractions at theme parks which begets merchandising opportunities which begets new movies, all building on each other like a cinematic universe in real life. Indeed, it is a testament to just how lucrative the traditional TV model is that it took so long for Disney to shift to this approach: it is a far better fit for their business in the long run than simply spreading content around to the highest bidder. This is also why Disney is comfortable being so aggressive in price: the company could have easily tried charging $9.99/month or Netflix’s $13.99/month — the road to profitability for Disney+ would have surely been shorter. The outcome for Disney as a whole, though, would be worse: a higher price means fewer customers, and given the multitude of ways that Disney has to monetize customers throughout their entire lives that would have been a poor trade-off to make. There is other content in the app, including The Simpsons and a smattering of family-friendly Disney Studios movies that don’t fall under these brands, but this is not a service that will be focused on acquiring content for content’s sake, a la Netflix. 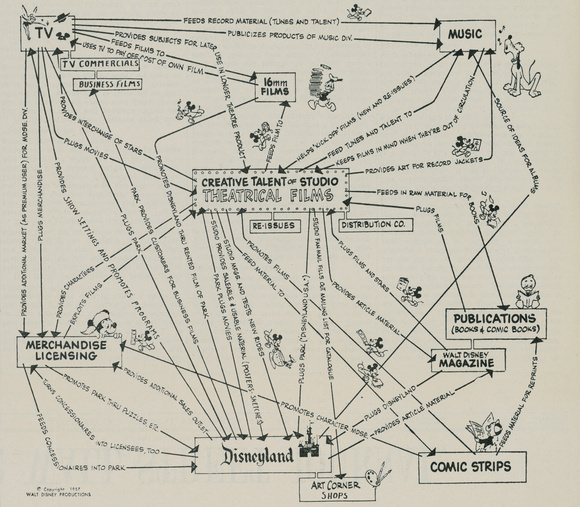 This is about the larger Disney machine. Instead it falls on Hulu to be the Netflix competitor, or, probably more accurately, the Netflix hedge. As long as Hulu is around Netflix is not the only alternative for selling streaming rights or original content that happens to exist for its own sake, not because it is part of something bigger. Disney, of course, makes plenty of that type of content as well (particularly after the 21st Century Fox acquisition) and would benefit from there being more buyers than fewer (even if one of the buyers is itself). Hulu also sells the traditional cable bundle as a streaming service, something else Disney remains interested in supporting. It will also be interesting to see what sort of bundle offer Disney comes up with for Disney+, Hulu, and ESPN+; thanks to Hulu Live that bundle could include basically all types of content except what is on Netflix (and Amazon Prime Video and Apple TV+ — more on those in a moment), which would make Disney not simply the Disney of the traditional TV bundle but the Comcast as well. Netflix is an Aggregator, leveraging its massive subscriber base to buy the shows it wants from ever-weakening suppliers unable to break away from their traditional revenue streams, even if they are shrinking (thanks to Netflix). The focus for Netflix will be having all types of shows for all kinds of people all being charged a slowly-but-surely rising monthly rate. To put it another way, the best way to think about Netflix is not as a channel but rather as the new cable company, albeit one solely focused on evergreen content (i.e. not live). Disney is, well, it’s Disney, pursuing a strategy as unique as the company itself. 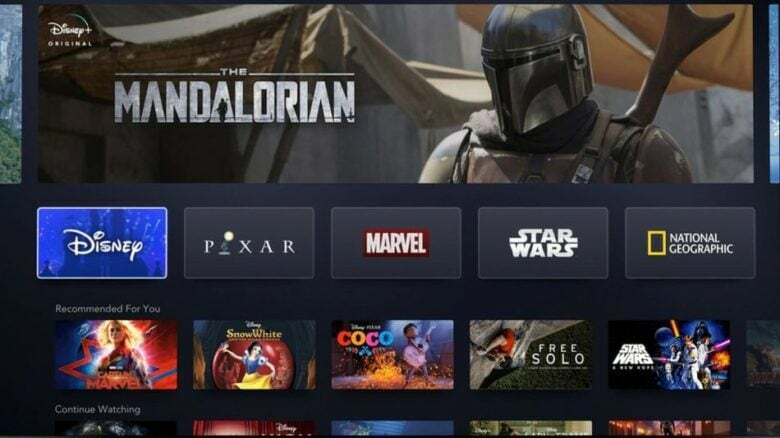 Disney+ will be a popular service, but the goal is not to build an Aggregator like Netflix but rather something that enhances and expands the Disney machine. Hulu, meanwhile, will continue as a nominal Netflix competitor and general guardian of Disney’s non-branded content businesses. Traditional TV will be dominated by news and sports, with ESPN, Fox, and Turner the biggest players. All have very strong assets in sports and/or news, and will remain dependent (and why not!) on the traditional TV mix of advertising and ever-increasing affiliate fees. The long tail of content, including most information and education, will continue to be dominated by YouTube and its advertising-based model. The specialists include longtime direct-to-consumer networks like HBO and Showtime, as well as the various attempts by traditional networks to go direct-to-consumer. I suspect most of them will find it difficult to achieve the sort of scale with streaming that will justify making the sort of investments that Disney has committed to, leaving a muddle-along approach that includes traditional TV, sales to Netflix and Hulu, and standalone streaming services. The resellers will help the specialists get in front of consumers and facilitate the transaction, taking a cut along the way. This was always the model for HBO and Showtime, but now instead of the cable companies being in the middle it is Amazon Prime Video and Roku, and later this year, Apple TV. I think this is also the best way to understand Amazon and Apple’s original content ambitions; the point isn’t to compete with Netflix, but rather to make their storefronts the place consumers go to to subscribe to other services. Note that each of five categories does a different “job”, and has a different business model; if “the single most defining feature of the Internet from a business perspective is the removal of the means of distribution as the primary point of differentiation in a value chain”, it follows that the most important part of succeeding on the Internet is building a business model that aligns with jobs instead of the other way around.